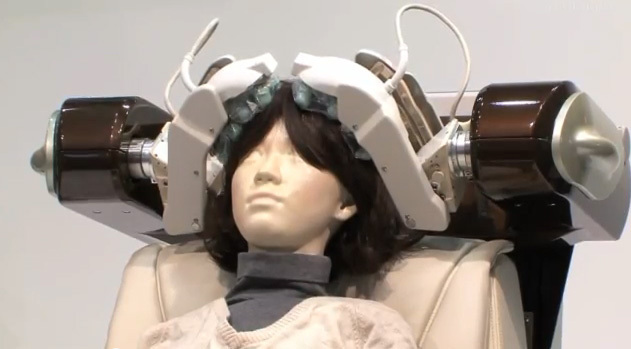 At Japan Robot Week 2012, Panasonic presented their new head-therapy massager robot, using recently developed robotic hand technology. The device scans the user’s head to create a 3-D image, which is used to position the robot’s arms and 24 fingers, ensuring a comfortable fit. Panasonic intends to offer the head therapy unit together with its massage chairs, which have been on sale for several years already, as a ‘whole body care’ system. Although the unit on exhibit here was being presented mainly as a massage product, Panasonic had already put it through field trials this past spring in a hair salon in Hyogo Prefecture, where it shampooed, conditioned, rinsed and dried customers’ hair, in addition to providing scalp massages. Sensors built into the unit were designed to detect differences in head shape and hair volume, and adjust performance accordingly. The video below includes English captions and narration. 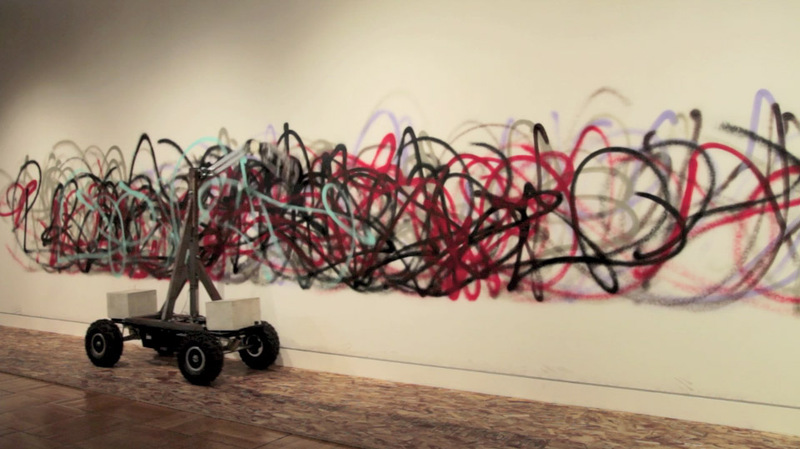 Artist/engineers So Kanno and Takahiro Yamaguchi have created a graffiti-tagging robot that produces its own unique designs as it trundles back and forth in front of a blank wall. An original work produced by Kanno and Yamaguchi’s device. Titled the “Senseless Drawing Bot,” the device is mounted on a motorized skateboard that jostles forward and back in order to set the can of spray paint in motion. By using a double pendulum arm, the robot’s swinging motions, and thereby the designs it produces, are chaotic and completely unpredictable. The Senseless Drawing Bot was on display this past February at the National Art Center in Roppongi as part of the 15th Japan Media Arts Festival. 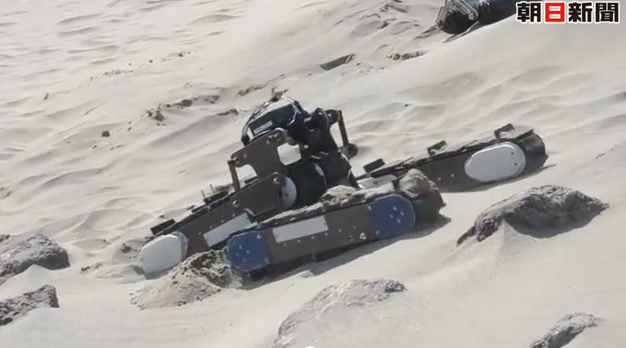 The seaside Nakatajima Sand Dunes in Central Japan hosted several would-be lunar explorer robots and their support teams on March 13 for a public demonstration and training run in a simulated lunar environment. Seven teams from universities around Japan arrived here with their robots after being invited by JAXA (Japan Aerospace Exploration Agency) to come and show off their work. As a follow-up to their Kaguya probe, which took HD images of much of the moon’s surface from 2007 to 2009, JAXA has proposed sending a rover by 2025 to continue Kaguya’s work by exploring the moon’s surface directly, and has been collaborating with universities in creating new rover designs. 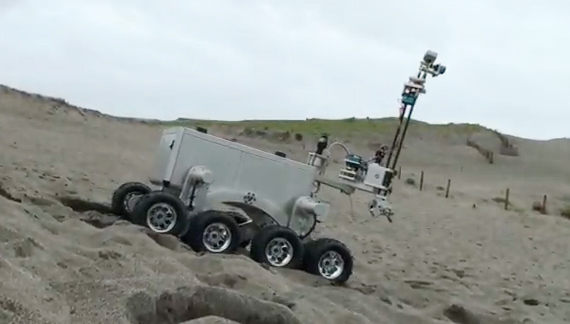 The Nakatajima Dunes, just a short bus ride from Hamamatsu City in Shizuoka Prefecture, were selected for their wide expanses of soft, fine sand dotted with large rocks and the treacherously steep inclines that come close to the kinds of terrain the rovers will encounter if they make it to the moon. The high winds and sea spray they experienced on the beach, however, are unlikely to be a factor. 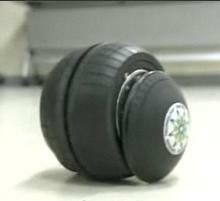 Notable designs include the Track-Walker 2 from Tohoku University in Sendai, which used multiple caterpillar treads to navigate the uneven terrain by lifting itself over obstacles too big to crawl over. Aichi University of Technology brought LUBOT, an eight-wheeled design that features a movable arm for mounting video cameras and a working scoop for gathering samples. The video below was taken by the students themselves during a test run at Nakatajima last July. Another design that garnered a fair amount of interest was the Tri-Star IV 3-wheeled rover from Tokyo Institute of Technology. The wheels use a combination of flexible supports and metal claws to navigate uneven and unstable terrain, and appears capable of righting itself if it turns over. According to Professor Shigeo Hirose, it can navigate slopes as steep as 30 degrees, and has mobility at least equal to what the US and Russia have built so far. A while back I wrote about the lift-off of JAXA astronaut Satoshi Furukawa, who, along with RSA cosmonaut Sergey Volkov and NASA astronaut Michael Fossum, set off for the International Space Station on a five-month expedition. On August 23, a new crew member was awakened to assist the team: Robonaut 2, a prototype that NASA hopes will soon be able to able to work side-by-side with human astronauts. 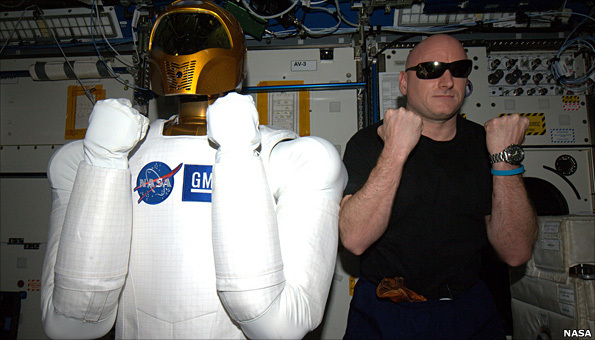 Robonaut 2 aboard the ISS following a successful activation. 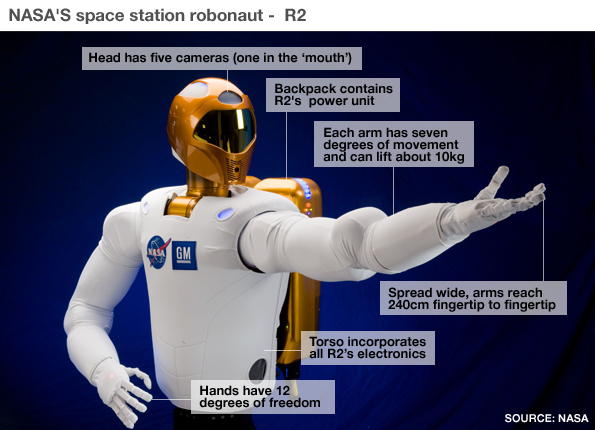 Robonaut 2, or R2, arrived at the ISS in February, riding aboard the Space Shuttle Discovery on its final flight. At the time, it was unpowered and could do little more than pose for the cameras. 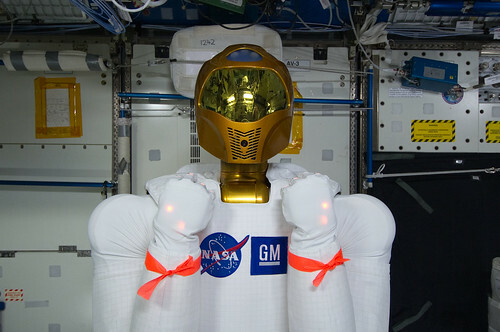 The result of a joint project between NASA and General Motors, R2 was developed to assist astronauts aboard the ISS with routine maintenance functions and possibly even help with hazardous jobs outside the space station in the future, as well as to test the feasability of robots playing more substantial roles in future space missions. 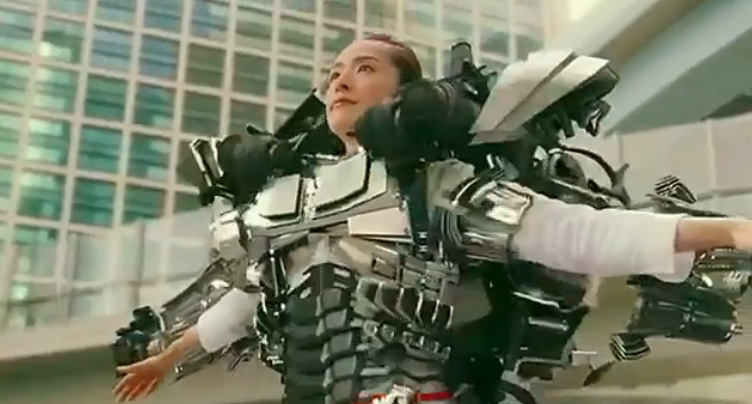 A humanoid form was chosen so that it could operate in the same environments as humans without requiring special alterations to be made to accommodate it. Upon being opened from its storage case, astronauts Mike Fossum and Satoshi Furukawa put R2 through a ‘power soak’ to ensure its electrical systems are functioning properly. The first motion test is scheduled for early morning (US time) September 1. R2 is currently just a head, torso, and arms (though still weighs in at about 150kg), although if initial tests are successful, additional components may be carried up by future missions to provide R2 with a battery for wireless operation, a mobility platform for more freedom of movement around the interior, and possibly even upgrades to allow it to work in the vacuum outside. Robonaut 2’s head is almost completely taken up by the five cameras inside, arranged so as to give it depth perception. Despite its large brain, powered by 38 Power PC processors and fed by over 350 sensors, R2 will not be working autonomously: all of its actions will be directly controlled by station crew members or technicians on Earth. R2 is significantly stronger and faster than its predecessors, although the 10kg load limit of its arms and 5kg grasping force in each hand mean it won’t be doing much of the heavy lifting. Currently, Robonaut 2 has its own Flickr photostream, its own Facebook page, and even its own Twitter feed, where it (or rather someone with NASA’s PR department) answers questions about its capabilities and mission (first tweet upon being switched on: “Those electrons feel GOOD! One small step for man, one giant leap for tinman kind”). P.S. The Sep 1 motion tests appear to have gone well. P.S. 2 [Added Sep 8, 2011] I realize this isn’t really Japan-related. I could justify it by saying that Japanese astronaut Furukawa is on board the ISS doing some of the start-up tests, but that’s a reach. Basically, I found this interesting and I needed to post something to snap out of my month-long doldrums. 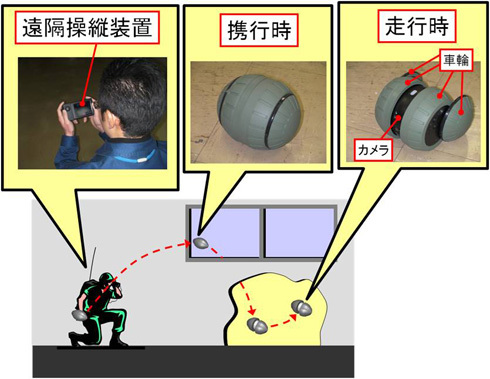 The Technical Research and Development Institute (TRDI), part of Japan’s Ministry of Defense and roughly an analogue to America’s DARPA, recently released information on one of the new devices being worked on at their Advanced Technology Development Center: the 手投げ式偵察ロボット, or Thrown Reconnaissance Robot. About the size and shape of a hand grenade, this device is designed to be thrown into buildings that may be too dangerous for soldiers to investigate themselves. Once inside, the device opens up to reveal a small camera, which can then relay what it sees to the soldiers waiting outside using a hand-held viewer. The robot can also be driven and steered throughout the building (though stairs will likely pose a problem), while the camera continues to transmit a stable image. Left: The remote viewscreen; Center: the robot in its carried and thrown state; Right: the robot in its traveling state, with drive wheels extended and camera exposed. According to TRDI, the concept behind this design is to develop robots that are compact and lightweight enough that soldiers can carry them as part of their standard equipment. I would imagine that making them sturdy and reliable enough to handle being thrown around would also greatly improve the battlefield utility of future robot designs.